Registration is Fast and Simple! 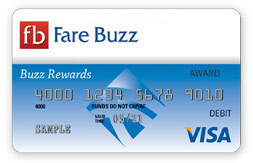 Once you reach 5 points, Fare Buzz Visa Prepaid Card worth $5 will be issued and mailed to you. Your card is re-loadable. As you continue booking with Fare Buzz, you will earn points on a weekly basis as bookings are made. Use the card promptly and before valid thru date. Funds do not expire and may be available after card expiration date, monthly account management and post-expiration re-issuance fees may apply, subject to applicable law. What do I do if the card is lost or stolen? To sign up for Buzz Rewards, please fill out the form below.